Set the stage for enjoying a relaxing happy hour with this personalized pub height tasting table. 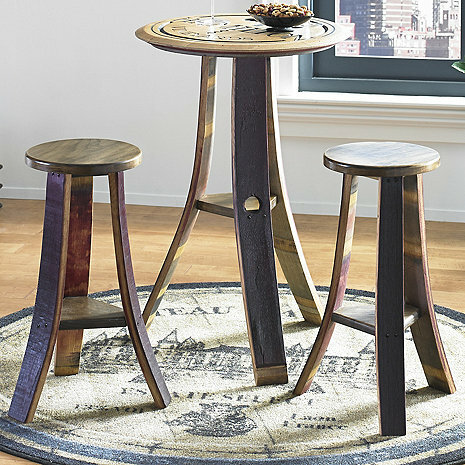 Thoughtfully crafted from a recycled barrel head set on three wine stained, barrel stave legs. The personalization is deeply carved and stained in a rich espresso to provide contrast. A smooth gloss finish lets the natural character of the oak top shine through. Perfect size for smaller spaces. Can you order it without the personalization ? BEST ANSWER: This is a custom order which cannot be placed online, please call our sales department at 800.356.8466 and they can assist you with this. Thank you. Base was too short. Table height was advertised as 36” and it is 32.5”. Have still yet to have it resolved. May never use this website again.